Outstanding classic stylized hard-boiled noir from prolific genre master Max Allan Collins ("The Road to Perdition" and tons of other stuff). 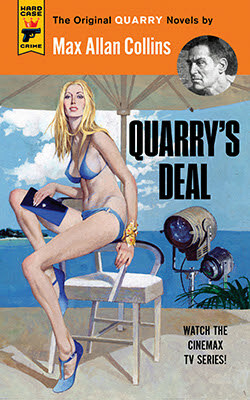 Quarry is the ultimate two-fisted brooding anti-hero character and Collins gives him a suspenseful, colorful mystery adventure full of femme fatales and shady operators in the tradition of Mickey Spillane, Dashiell Hammett, etc. Collins uses a wonderful, ultra-lean style in this fast-paced crime tale and this book definitely left me hungry to read more Quarry novels. This novel was first published in 1967 and Hard Case Crimes has done their usual bang-up job in with this beautifully packaged 2016 edition featuring absolutely gorgeous knockout cover art by master illustrator Robert McGinnis. Thoroughly enjoyable guilty pleasure novelization (based on a screenplay by David Simkins) of the 1987 comedy film that marked the directorial debut of Chris Columbus, the screenwriter of "Gremlins", "The Goonies", and "Young Sherlock Holmes" who would go on to direct many blockbusters including "Home Alone" and the first two "Harry Potter" films. 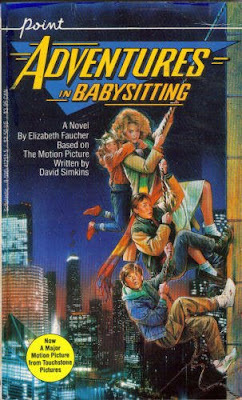 The movie was a minor sleeper hit and featured a winning performance by Elizabeth Shue. The author Elizabeth Faucher does a good job of capturing the movie's charm and breezy humor and really nails the pop culture vibe and vernacular of the mid/late 1980's.